We Are Your Flat Roof Repair and Installation Experts. Do you need repairs for a flat roof in Texarkana, TX? Owning a building with a flat roof can be a little different than your traditional sloped roof. Although it may seem daunting when it comes to ensuring it doesn’t leak, with the right professional you can create a roof that will last you and your business decades to come. 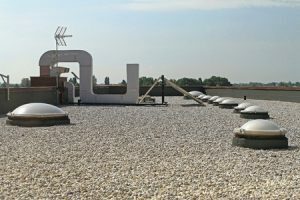 While a traditional commercial roof seems pretty straightforward, there are several options when the time comes to repair or replace your flat roof. Luckily, no matter what option you choose the experts at R.B.T Construction Roofing Division has the knowledge and experience to get it done fast, and to get it done right. If you’re interested in learning more call the experts today at 903-691-0931. What are my Flat Roof Options? When it comes to installing or repairing a new flat roof in Texarkana, TX there are several options available on the market today, and knowing which is the right one for you can be challenging. Here at R.B.T Construction Roofing Division we are passionate about roofs and would love to speak with you about the many different options available when it comes to protecting your investment. Our Pros Are Able to Keep Your Flat Roof in Good Condition for Years to Come! PVC– This is a great option when you need a single ply roof that is both durable, and energy efficient. EPDM– Similar to PVC roofing, EPDM uses a single ply roll on application, allowing for quick installation and repair. EPDM is one of the most durable roofing options on the market today. TPO– If you’re looking for a roof that is energy efficient, and reflects the brutal heat from the sun, then a TPO roof is a great option for you. Metal– Some people just love the sound of the rain on a tin roof at night, but a metal roof is more than just pretty. Metal roofs are extremely durable and in many cases can last 45 years. Modified Bitumen– This type of flat top roofing is created through the use of asphalt, and modifiers to create a waterproof barrier. Modified Bitumen is a great option if you are looking for a cheaper alternative that will still get the job done. A Modified Bitumen roof will last about 10-15 years on average. Roofing Coatings– There are several different approaches when it comes to roofing coating. They all work in a similar manner through the application or spraying of materials on the roof in order to create a waterproof barrier. BUR– Built up roofing, or BUR for short is an oldie but a good one. As one of the most reliable flat top roofing methods, you can’t really go wrong. With so many different options when it comes to flat roofing it can be a little intimidating for the uninitiated. Luckily you can trust your hometown experts of R.B.T Construction Roofing Division to help you navigate through your different flat roof options. When you’re looking for repairs or installations for a flat roof in Texarkana, TX call the professionals you can rely on at 903-691-0931. Updated on August 30, 2018 at 10:48 am by R.B.T. Construction Roofing Division.